A comment from Bill Schuetter today provided the missing clue to discovering a source for tuned squeeze horns. Bill provided a link to a YouTube video of the LA Philharmonic performing Gershwin’s ‘American In Paris’. There they are! and certainly orchestras around the world would need these to perform Gershwin. I found a few sources. See links below. [Update 5/11/15] There you go! Owner Russ Knutson, of Chicago Percussion Rental comments below to point out that the horns in this shot came from his shop. From CaliforniaPercussion.com (renting at $100 a week + shipping). George Gershwin wrote for Tuned Taxi Horns in his composition An American in Paris. These horns come in a set of 4 pitches: A, B, C, & D. We have 3 sets of tuned taxi horns in our rental department and they all sound FANTASTIC! You will have no issues with our taxi horns; no muffled or dog barkish sounds, just pure taxi horn tone! As a percussionist for 10 years in the San Francisco Symphony, Trey Wyatt has used these horns for over 50 performances without failure. The taxi horn part is normally played by one player. Gershwin actually writes for 2 players to each play 2 horns. However, it works brilliantly for this part to by played by 1 player, the cymbal player, as the cues for all the horn parts are written in the cymbal part. Certainly not cheap to purchase. That’s about $750. U.S. From Kolberg in Germany. A little cheaper at around $650 (but without the stand) from Jam in the U.K. Most orchestras rent the set of horns. In the U.S. often from Steve Weiss Music outside of Philadelphia. Also from LA Percussion Rentals. FSTJ Percussion in Quebec, Canada, and above-mentioned California Percussion. I’ll be looking for a U.S. source to purchase. I’ve also emailed an Indian manufacturer to see what the thinks about custom building tuned horns. which are in the picture on your website. is clearly on the side of the black wood frame. and you don’t even mention Chicago Percussion Rental on your website. 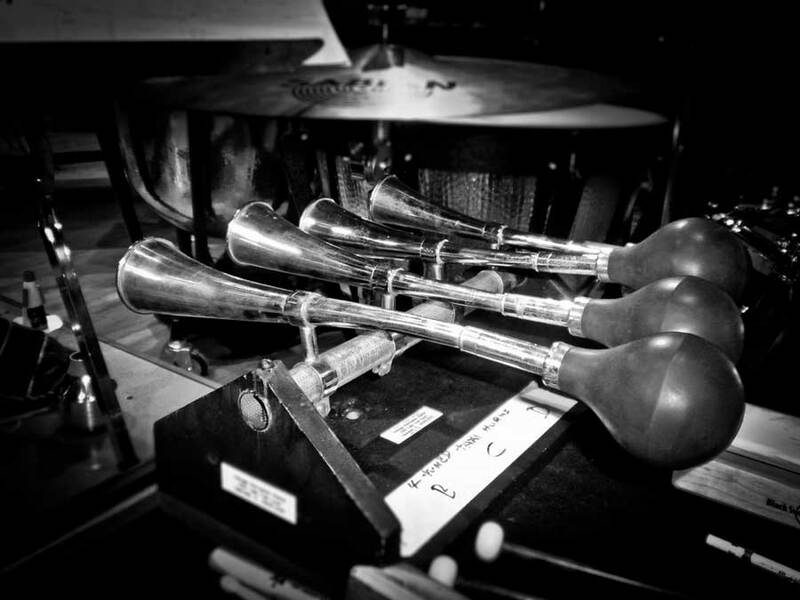 the 4 tuned taxi horns needed for American in Paris. I thank you in advance for correcting your website. The often heared A-B-C-D tuning is not correct. It was only a indication in de score wich horn to play. The original tuning of the bulb horns are: Ab (sounding 415Hz) – Bb – d (high) – A’ (low, sounding 220Hz). Listen to the genuin recording of 1929. The original picture showing Gershwin himself with 4 horns exists: the 4th is a very big one and so it is impossible that the 4th is sounding higher dan the little 3th. It ‘s time now to adapt to the right stuff.